I've been speaking with Bob Honold, a Republican strategist hired by the NRCC to craft TV and digital ads for the Georgia House special election, in which the GOP's Karen Handel beat Democrat Jon Ossoff. "The energy on the left was considerable — and the $25 million sent to Ossoff was a product of that energy that posed a huge problem," he says. "That unprecedented amount of money put the race squarely in jeopardy." "Many factors were necessary to win — including a great campaign by Karen Handel and her team...[but] without the enormous amount allotted by the NRCC [more than $7 million], and without the specific and methodical ways we spent it on TV and digital – we would not have won. The same can be said for the incredible work done by CLF (Congressional Leadership Fund)." During the jungle primary they identified him with unpopular party leader Nancy Pelosi, and portrayed him as just another liberal. (The Pelosi branding became a centerpiece of the GOP strategy throughout the race, and is part of the reason her leadership is under new jeopardy.) The Republicans also used Ossoff's own TV ad against him to highlight the fact that he did not support repealing Obamacare, and remind voters that Ossoff does not live in the district. Also during the jungle primary – Republicans used residents of the district to accuse Ossoff of lying about his credentials, and they again reinforced the branding of him as a Pelosi liberal who'd raise taxes and weaken the military. 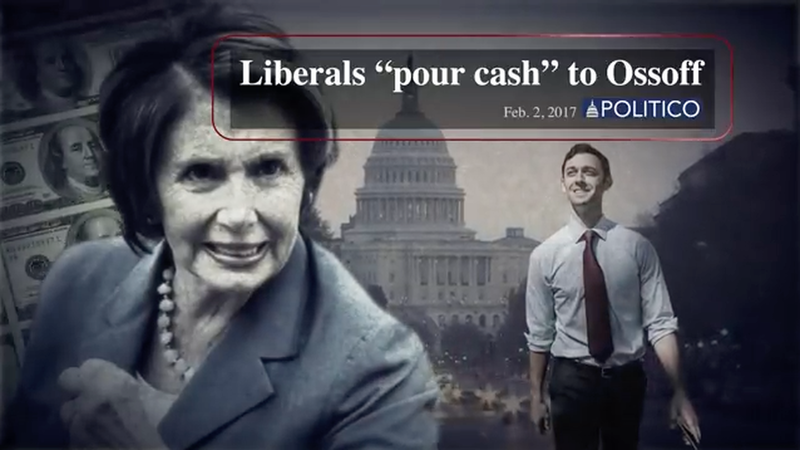 Straight after the primary, they ran a contrast ad — framing Ossoff as a carpetbagging Hollywood/Pelosi liberal and Handel as a "proven fighter for Georgia." National security played a surprisingly heavy role in the messaging given Ossoff had never taken a vote that could be used against him. Republicans used the fact that he'd supported Obama's Iran deal to brand him as "naive" and soft on terrorism. Doubling down on the "Ossoff is too risky" national security messaging because Republican internal polling showed it was damaging him. Honold believes the issue helped to disqualify Ossoff to many independents and motivated Republicans who were previously considering staying home. When early voting began, Republicans aired a get-out-the-vote ad on Fox News and History Channel and on targeted digital/mobile destinations. Republican internal polls showed some of the voters who didn't like Trump — and were considering either staying home or voting for Ossoff as a protest vote — also happened to be motivated by a disgust for what they viewed as extreme behavior by liberal protesters. Republicans ran an ad titled "Childish Radicals" that played to that disgust — and used the controversial image of Kathy Griffin holding up Trump's severed head. The closing argument: Republicans used a formula that had worked earlier in the campaign, filming voters from the district and repeating the key branding words for Ossoff — "childish," "naïve" and "inexperienced." And — of course — there was Nancy Pelosi. Last word: "The massive investment made by the NRCC and the strategic message progression executed by Honold destroyed Ossoff," says Guy Harrison, another top Republican strategist and former NRCC executive director.